The Egyptian working class are finding out the bitter truth of those words. In the face of unpaid wages and rampant inflation they have once more stepped onto the stage by re-asserting their own demands. All-out strikes began in the steel sector in August and were resumed in December 2013 when workers staged a three week long sit-in to get the management to cough up arrears of pay. This was followed by workers at the Scimitar Petroleum Company. Both groups of workers were violently attacked by the forces of the state. Then on February 10, it was the turn of the textile mills of Mahalla. Here 12,000 workers at the Mahalla Weaving and Textile Co., the country’s largest textile plant, struck for a higher minimum wage and to get their back pay. The workers also called for the dismissal of the company bosses, Fouad Abdel Aleem Hassan and Abdel Fatah al- Zoghba, and the formation of an elected board of directors to manage the company’s affairs as well as new investment (the factory was working at 40% capacity because the management could not afford to buy raw cotton). Within days they were joined by 12,000 more from the Kafr Al-Dawar Spinning and Weaving Company and workers from 15 other factories run by the Holding Company for Weaving and Spinning which runs all public-sector textile firms in Egypt. Mahalla will be familiar to anyone acquainted with Egypt and its working class struggle. 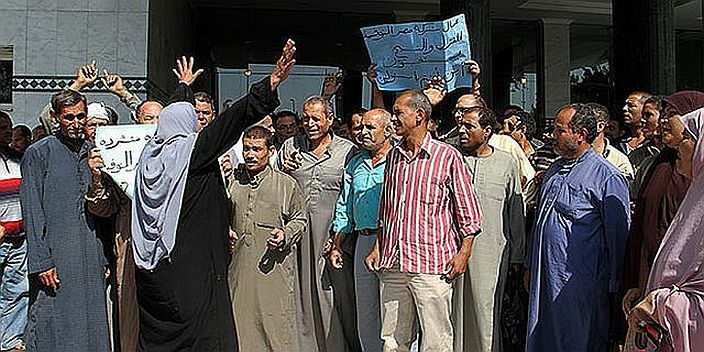 It was here in 2008 that the same workers struck for the same demands that led to the beginning of the unravelling of the Mubarak regime three years later. Back then other workers did join them but the current strike wave has gone further. Strikes have spread across Egypt. Doctors, pharmacists, public transport employees, low-ranking policemen, pensioners, post office employees, garbage collectors and workers in several other state-owned enterprises have struck; all demanding higher salaries and better working conditions. In all over 100,000 have already walked out this year and some have occupied their workplaces. And let’s not forget, in 2011 Mubarak killed 800 demonstrators on Tahrir Square without giving up power. But the Army only got rid of him very quickly after some of the 25 million strong working class downed tools. The Army is the leading capitalist force Egypt and the military junta have not been slow to see the threat the working class poses to both their wealth and power. Mahlab has described his new cabinet as a government of “warriors” which is bad news for opponents of the regime, including the working class. Economically the situation in Egypt is so bad that if workers don’t make those “excessive” demands they will themselves be destroyed. In reality their demands are very modest compared to the real economic hardship they face. “The strike by about 38,000 public bus drivers forced authorities to use the army and the private sector to provide alternative services. The drivers finally agreed to a $30 increase, but their monthly pay remains below the new minimum wage of $170 (1,200 Egyptian pounds – CWO). In fact the minimum wage the workers are demanding is exactly the same as in 2008 but the currency has plunged and prices have risen enormously since then. Inflation was 6.5% in 2007 but rose to 18% by 2009 since when it has oscillated around 10-12%. As one worker stated, even a minimum wage of 2000 Egyptian pounds would not now be equal to the original demand. And the government has excluded so many categories from the minimum wage laws (like the transport workers) that it is a nonsense anyway. There is a certain sense of déjà vu in all of this. Egyptian workers have been promised so many times that their pay would be raised and all arrears of pay met only to find time and time again the bosses renege on the deal. In fact in Mahalla they not only had the same economic demands as in 2007-8 but were even demanding the removal of the very same managers they had condemned 6 years ago. The present strike wave is based on the fact that workers across the board are increasingly impoverished due to the dire state of the Egyptian economy and there is also a recognition that they will get nothing unless they go on all out strikes. They have seen that the civil service, police and army have all received wages rises and/or better pensions. Many believe that the money is there and it needs to be shaken out of the bosses by strikes and factory occupations. However the Egyptian economy truly is in a dire condition. On the macroeconomic front, the latest official figures continue to show an economy in a state of distress. The growth rate is sluggish, with output only up one percent in the first quarter of the current FY 2013-2014; the high unemployment rate currently stands at 13.4 percent—close to 70 percent of the unemployed are youth, and 82 percent of the jobless are educated. Inflation also continues to rise, presently at 11.4 percent, thus exerting more and more pressure, particularly on the poor, who represent 25 percent of the country's growing population. Public debt, both domestic and foreign, is also soaring and by the end of 2013 it reached 268 billion dollars (about 107 percent of Egypt's GDP). The fiscal deficit is expected by international observers (the World Bank and the Institute of International Finance) to remain this year in the double digit territory despite stated government efforts to bring it down. And the currency black market is making a comeback, with the dollar currently trading at 6 percent above the official exchange rate despite continued CBE intervention. What is worse is that all this comes after the massive bailouts to the al-Sisi regime by Saudi Arabia, Kuwait and the UAE after the overthrow of Morsi last July. The idea was to use the money to stimulate economic growth which would then allow the state to dismantle its food and fuel subsidies which take up to 30% of the budget. Without these subsidies life would be impossible for most Egyptian workers and peasants but they are seen by the capitalist class as a retrogressive impediment on the stabilisation of the economy. Of course if they paid the workers a half decent wage then they would be able to pay “market” prices for food and fuel but currently, even with the subsidies, 50% of family earnings go on food consumption alone. In a global capitalist crisis the army-dominated Egyptian bourgeoisie are thus caught in a cleft stick. Neither Mubarak, not Morsi nor al-Sisi can break the Gordian knot of this crisis but they do have one ally – the lack of experience of class war amongst the Egyptian working class. Faced with an increasingly dysfunctional capitalist system where no economic revival is in sight Egyptian workers have come to recognise that their misery will not be alleviated without a fight. The problem is how to conduct that fight. In the dominant capitalist countries workers have come to realise that the unions by accepting capitalist legality in everything spend more time defending the organisation than its members. To all intents and purposes they are bureaucracies run largely for the bureaucrats whose heads earn six figure salaries like the head of any big business. Most workers today rarely hear of their union’s activities because most of these are directed towards acting as a pressure group for the biggest “left” capitalist party in every country. No such ambiguities existed around the Egyptian Trades Unions Federation (ETUF) which was openly part of the management of labour under the Mubarak regime. Perhaps the ETUF is best known for organising the mounted camel attack on the demonstrators in Tahrir Square in 2011. Most workers had long since stopped counting on these state trades unions. Under the pressure of an escalating crisis of poverty they sought new organisations within which to act in solidarity and with their collective strength. The first of these was the Independent Union of Real Estate Tax Collectors formed by Kamal Abu Eita. When more workers decided to go outside the law and form further independent trades unions after 2007 they eventually federated in 2011 to form the Egyptian Federation for Independent Trades Unions (EFITU) which made Kamal Abu Eita its General Secretary. When al-Sisi came to power he thought he could tame labour through a combination of increased numbers of public sector jobs by half a million, plus threats and the appointment of one of “their own” as minister of labour. Kamal Abu Eita no less. This caused consternation, not only amongst his own supporters who accused him of selling out, but also amongst the bureaucrats of the ETUF. There were demonstrations against the appointment from Alexandria to Suez (from supporters of an independent working class movement) and the ETUF organised a demonstration of hundreds in Cairo. Logic would have suggested that the ETUF should have disappeared with all the other trappings of the Mubarak era. But not so fast. Unions in “emerging” countries which have legal status are like a freemasonry. They exist on having access to state officials who can distribute jobs and largesse of other kinds. As long as you are a loyal client you will be looked after and the union goons act to keep out the riffraff who might lower wages. The ETUF may have lost Mubarak but they are still loyal to the army so have not lost their clientelist power. By appointing Abu Eita as Minister of Manpower and Migration in July 2013 al-Sisi gave him power over both trades union federations (although he had resigned as General Secretary of EFITU). Soon he was purging the leadership of the ETUF on the grounds that they were in cahoots with the Moslem Brotherhood. The ETUF has not taken this lying down and the fight for members has now transferred to the shop floor. In the steel strike mentioned above the workers in the different union federations ended fighting each other rather than the bosses and this led to a lower settlement than the workers had been demanding. When the strikes did break out in December Kamal Abu Eita’s response was to reward his boss by calling out the forces of repression against his former comrades, and denouncing the strikers as puppets of the Muslim Brotherhood. And the former demonstrators in Tahrir, who hailed from the middle class, are now so much behind a military they once tried to overthrow that they were only too happy to agree with the suppression of workers’ demands. It is a cautionary tale and demonstrates that the Egyptian working class will have to go through a great deal to achieve even their own, very moderate, demands. But as all the economic statistics show, capitalism in Egypt cannot comply with even the minimal of requests. The economic and social tension continues to build. In this pressure cooker the Egyptian workers are finding that trades unions which become fixed legal bodies are inadequate in dealing with the situation. Abu Eita claimed to be anti-capitalist (he is a member of a Nasserist “socialist” political party) but has no idea what a socialist society would entail since he puts nation before class. Socialism is not about the state running a capitalist economy ostensibly with a better distribution of income, but about an entirely new social, political and economic order in which those who do the labour also play a full part in setting the goals of society. Workers everywhere need to shake off this trade unionist misconception of socialism and take on a wider political agenda. This though won’t come about overnight. There are a whole series of experiences that workers have to go through before the divisions and limitations of unions as forms of organisation are fully exposed. In the recent strikes the workers of Mahalla have responded to the failure of the previous free trades union leader by … founding another free trade union, The Free Union of Textile Workers. They hope that it will be a more honest body ready to fight for their demands. However what capitalism shows is that any permanent economic organ of the working class however authentically it might start, however responsive it is to the rank and file, has a tendency to seek legitimacy in order to negotiate. When that is once granted they cease to be real fighting organs and over time become just another layer of management. Capitalism’s continuing contradictions are not going to disappear. Wages are not going to be substantially raised in the short term. The cost of living is still increasing. Egyptian workers have been “moderate” and patient as they have watched their wages spiral downwards. The current strike wave may still be contained by the unions for now but it is questionable whether they can keep on doing this. Egyptian union leaders (of both federations) are already “patriotically” warning al-Sisi that “another revolution may be brewing”. They are doing their best to ensure this does not happen but they will be doomed once workers come to realise that it is not enough to beg for subsistence from the system. When that happens the Egyptian working class will be faced with an enormous leap into the unknown. We cannot predict where it will end but so long as the working class continue their search for their own autonomous bodies which they can rely on to defend their interests then they will take a real step towards a whole new world outlook. No part of the working class can win alone but more and more workers, not just in Egypt are being forced to put up a collective resistance simply in order to claim the means to survive. In common with the other battalions of the world working class these struggles will pave the way for new organisational and political forms that go, not just beyond unions, but also the capitalist system itself. Egyptian workers wages come in two parts; a derisory basic wage well below even the pathetic legal minimum currently in force plus a bonus which never gets paid.